In medicine, venipuncture or venepuncture is the process of obtaining intravenous access for the purpose of intravenous therapy or for blood sampling of venous blood. In healthcare, this procedure is performed by medical laboratory scientists, medical practitioners, some EMTs, paramedics, phlebotomists, dialysis technicians, and other nursing staff. In veterinary medicine, the procedure is performed by veterinarians and veterinary technicians. It is essential to follow a standard procedure for the collection of blood specimen to get the accurate laboratory results. Any kind of error in collection of blood or filing the test tubes may lead erroneous laboratory results. to collect blood for later uses, mainly transfusion either in the donor or in another person. Blood analysis is an important diagnostic tool available to clinicians within healthcare. Minute quantities of blood may be taken by fingersticks sampling and collected from infants by means of a heel stick or from scalp veins with a winged infusion needle. Phlebotomy (incision into a vein) is also the treatment of certain diseases such as hemochromatosis and primary and secondary polycythemia. There are many ways in which blood can be drawn from a vein. The best method varies with the age of the patient, equipment available and tests required. Greiner Bio-One manufactured the first ever plastic evacuated blood collection tube in 1985 under the VACUETTE brand name. Today, many companies sell vacuum tubes as the patent for this device is now in the public domain. These tubes are manufactured with a specific volume of gas removed from the sealed tube. When a needle from a hub or transfer device is inserted into the stopper, the tube's vacuum automatically pulls in the required volume of blood. The basic Evacuated Tube System (ETS) consists of a needle, a tube holder, and the evacuated tubes. The needle is attached to the tube holder by the phlebotomist prior to collection, or may come from the manufacturer as one unit. the needle protrudes through the end of the tube holder, and has a needle on each end. 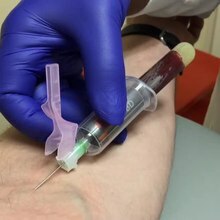 After first cleaning the venipuncture site and applying a tourniquet, the phlebotomist uncaps the needle attached to the tube holder, inserts the needle into the vein, then slides evacuated tubes into the tube holder, where the tube's stopper is pierced by the back end of the needle. The vacuum in the tube then automatically draws the needed blood directly from the patient's vein. Multiple vacuum tubes can be attached to and removed in turn from a single needle, allowing multiple samples to be obtained from a single procedure. This is possible due to the multiple sample sleeve, which is a flexible rubber fitting over the posterior end of the needle cannula which seals the needle until it is pushed out of the way. This keeps blood from freely draining out of the back of the needle inserted in the patient's vein, as each test tube is removed and the next impaled. Safety regulations require that needles come equipped with a sheath or safety device to cover the needle after the procedure to prevent accidental needle stick injury. Fittings and adapters used to fill evacuated tubes from butterfly needle kits and syringes are also available. There are several needle gauges for a phlebotomist to choose from. The most commonly used are as follows: a 21g (green top) needle, a 22g (black top) needle, a 21g (green label) butterfly needle, a 23g (blue label) butterfly needle, and a 25g (orange label) butterfly needle (however this needle is only used in pediatrics or extreme cases as it is so small that it can often result in hemolizing the blood sample). There are also a variety of tube and bottle sizes and volumes for different test requirements. The test tubes in which blood is collected may contain one or more of several additives. In general, tests requiring whole blood call for blood samples collected in test tubes containing some form of the anticoagulant EDTA. EDTA chelates calcium to prevent clotting. EDTA is preferred for hematology tests because it does minimum damage to cell morphology. Sodium Citrate is the anticoagulant used in specimens collected for coagulation tests. 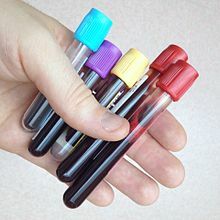 The majority of chemistry and immunology tests are performed on serum, which is produced by clotting and then separating the blood specimen via centrifuge. These specimens are collected in either a non-additive tube or one containing a clotting activator. This clotting activator can interfere with some assays, and so a plain tube is recommended in these cases, but will delay testing. Tubes containing lithium heparin or sodium heparin are also commonly used for a variety of chemistry tests, as they do not require clotting and can be centrifuged immediately after collection. A combination of sodium fluoride and potassium oxalate is used for glucose tests, as these additives both prevent clotting and stop glycolosis, so that blood glucose levels are preserved after collection. another specialty tube is an opaque amber colored tube used to collect blood for light sensitive analytes, such as bilirubin. Use of lidocaine iontophoresis is effective for reducing pain and alleviating distress during venipuncture in pediatric patients. A needle-free powder lignocaine delivery system has been shown to decrease the pain of venipuncture in children. Rapid dermal anesthesia can be achieved by local anesthetic infiltration, but it may evoke anxiety in children frightened by needles or distort the skin, making vascular access more difficult and increasing the risk of needle exposure to health care workers. Dermal anesthesia can also be achieved without needles by the topical application of local anesthetics or by lidocaine iontophoresis. By contrast, noninvasive dermal anesthesia can be established in 5–15 min without distorting underlying tissues by lidocaine iontophoresis, where a direct electric current facilitates dermal penetration of positively charged lidocaine molecules when placed under the positive electrode. One study concluded that the iontophoretic administration of lidocaine was safe and effective in providing dermal anesthesia for venipuncture in children 6–17 years old. This technique may not be applicable to all children. Future studies may provide information on the minimum effective iontophoretic dose for dermal anesthesia in children and the comparison of the anesthetic efficacy and satisfaction of lidocaine iontophoresis with topical anesthetic creams and subcutaneous infiltration. Non-pharmacological treatments for pain associated with venipuncture in children includes hypnosis and distraction. These treatments reduced self reported pain and when combined with cognitive-behavioural therapy (CBT) the reduction of pain was even greater. Other interventions have not been found to be effective and these are suggestion, blowing out air, and distraction with parent coaching did not differ from control for pain and distress. Some health care workers prefer to use a syringe-needle technique for venipuncture. Sarstedt manufactures a blood-drawing system S-Monovette that uses this principle. This method can be preferred on elderly patients, oncology patients, severely burned patients, obese patients or patients with unreliable or fragile veins. Because syringes are manually operated, the amount of suction applied may be easily controlled. This is particularly helpful with patients who have small veins that collapse under the suction of an evacuated tube. In children or other circumstances where the quantity of blood gained may be limited it can be helpful to know how much blood can be obtained before distributing it amongst the various additives that the laboratory will require. There are times where a patient may require a blood culture collection. The culture will determine if the patient has pathogens in the blood. Normally blood is sterile. When drawing blood from cultures use a sterile solution such as Betadine rather than alcohol. This is done using sterile gloves, while not wiping away the surgical solution, touching the puncture site, or in any way compromising the sterile process. It is vital that the procedure is performed in as sterile a manner as possible as the persistent presence of skin commensals in blood cultures could indicate endocarditis but they are most often found as contaminants. It is encouraged to use an abrasive method of skin preparation. This removes the upper layers of dead skin cells along with their contaminating bacteria. Povidone-iodine has traditionally been used but in the UK a 2% chlorhexidine in 70% ethanol or isopropyl alcohol solution is preferred and time must be allowed for it to dry. The tops of any containers used when drawing a blood culture should also be disinfected using a similar solution. Some labs will actively discourage iodine use where iodine is thought to degrade the rubber stopper through which blood enters the bottle, thus allowing contaminates to enter the container. The blood is collected into special transport bottles, which are like vacuum tubes but shaped differently. The blood culture bottle contains transport media to preserve any microorganisms present while they are being transported to the laboratory for cultures. Because it is unknown whether the pathogens are anaerobic (living without oxygen) or aerobic (living with oxygen), blood is collected to test for both. The aerobic bottle is filled first, and then the anaerobic bottle is filled. However, if the collection is performed using a syringe, the anaerobic bottle is filled first. If a butterfly collection kit is used, the aerobic bottle is filled first, so that any air in the tubing is released into the oxygen-containing bottle. Specially designed blood culture collection bottles eliminate the need for either the syringe or butterfly collection method. These specially designed bottles have long necks that fit into the evacuated tubes holders that are use for regular venipuncture collection. These bottles also allow for collection of other blood specimens via evacuated tubes, to be collected without additional venipuncture. The amount of blood that is collected is critical for the optimal recovery of microorganisms. Up to 10mL of blood is typical, but can vary according to the recommends of the manufacturer of the collection bottle. Collection from infants and children are 1 to 5 mL. If too little blood is collected, the ratio of blood-to-nutrient broth will inhibit the growth of microorganisms. If too much blood is collected from the patient, the patient risks a hospital-induced anemia and the ratio of blood-to-nutrient broth will tilt in the opposite direction, which also is not conductive to optimal growth. The volume of the blood sample collection is very important in experimental animals. All nonterminal blood collection without replacement of fluids is limited up to 10% of total circulating blood volume in healthy, normal, adult animals on a single occasion and collection may be repeated after three to four weeks. In case repeated blood samples are required at short intervals, a maximum of 0.6 ml/kg/day or 1.0% of an animal's total blood volume can be removed every 24 hours. The estimated blood volume in adult animals is 55 to 70 ml/kg body weight. Care should be taken for older and obese animals. If blood collection volume exceeds more than 10% of total blood volume, fluid replacement may be required. Lactated Ringer's solution (LRS) is recommended as the best fluid replacement by National Institutes of Health (NIH). If the volume of blood collection exceeds more than 30% of the total circulatory blood volume, adequate care should be taken so that the animal does not suffer from hypovolemia. It is generally not advisable to use isopropyl alcohol to cleanse the venipuncture site when obtaining a specimen for a blood alcohol test. This has been related largely to the potential legal implications associated with use of alcohol based cleaners that could theoretically impact analysis. Numerous police alcohol collection kits have been marketed that incorporate a sodium fluoride/potassium oxalate preservative and non-alcohol based cleansing agents to ensure proper collection. Using soap and hot water or a povidone iodine swab are advisable alternatives to isopropyl alcohol in this case. Arterial blood is taken from an artery instead of a vein. ^ a b Higgins, Dan (28 September 2004). "Venepuncture". Nursing Times. 100 (39): 30. ^ Dg, Dayyal. "PROCEDURES FOR THE COLLECTION OF BLOOD FOR HEMOTOLOGICAL INVESTIGATIONS". BioScience Pakistan. BioScience Pakistan. ISSN 2521-5760. ^ Perry, Sally (2007). "Ask the Lab: Hemolyze blood specimens". Nursing.advanceweb.com. Retrieved 2013-12-29. ^ a b Rose, John B.; Galinkin, Jeffrey L.; Jantzen, Ellen C.; Chiavacci, Rosetta M. (2002). "A Study of Lidocaine Iontophoresis for Pediatric Venipuncture". Anesthesia & Analgesia. 94 (4): 867. doi:10.1097/00000539-200204000-00017. ^ Lacroix, Helene (2008-10-01). "A needle-free powder lignocaine delivery system reduced the pain of venipuncture in childrenCommentary". Evidence-Based Nursing. 11 (4): 106. doi:10.1136/ebn.11.4.106. ISSN 1367-6539. PMID 18815318. ^ Ltd, BMJ Publishing Group Ltd and RCN Publishing Company (2006-01-01). "Liposomal lidocaine improved intravenous cannulation success rates in children". Evidence-Based Nursing. 9 (1): 10. doi:10.1136/ebn.9.1.10. ISSN 1367-6539. PMID 16437788. ^ Hoff, J. (2000). "Methods of Blood Collection in the Mouse" (PDF). Lab Animal. 29 (10): 47–53. ^ a b Parasuraman, S; Raveendran, R; Kesavan, R (2010). "Blood sample collection in small laboratory animals". Journal of Pharmacology and Pharmacotherapeutics. 1 (2): 87–93. doi:10.4103/0976-500X.72350. PMC 3043327. PMID 21350616.